(04-13-2017, 07:43 PM)Gumby Wrote: I use a free one called ispring its very limited but gets the job done. Never Underestamate what people are intrested in. In the past two years I have topped $2500 USD posting my Artwork on Revenue sharing sites. Not getting Rich but its spending money. Hey thanks, I've been looking for something like that. Just click a few different diamonds after the page loads. (04-15-2017, 12:02 AM)Berries Wrote: I've heard the free version of Lightworks is pretty good. I haven't tried it myself though, I've been using mostly Premiere and Final Cut. This is the creme de la creme of video editing programs. I'd certainly be interested in what you come up with. (04-13-2017, 06:44 PM)Accidental Stoner Wrote: Seems we have a thing or two in common, dclements. Takes patience and nerves of steel. Thanks for the replies and encouragement.. I spend a good part of the day yesterday trying to get videos through torrent and today dealing with a headache/having to return the laptop I use to my sister so she can use it so I apologize for being late in replying to my own thread. Hopefully things will be a little better tomorrow. Most of them have a bit of a learning curve, but not like AutoCad or anything. (04-13-2017, 06:48 PM)Octo Wrote: I don't think Premiere is anything you want to start out with to be honest. There's another thread about this with suggestions on free video editing software. Let me try to find it for you. BTW Octo, where did you find the pic for your new avatar? 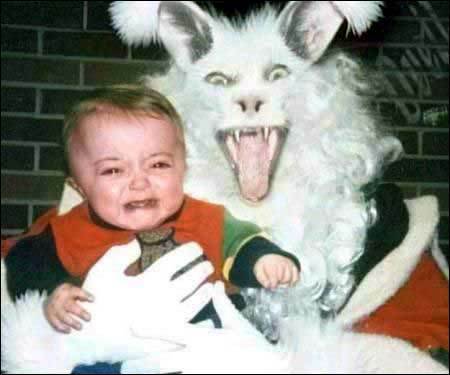 It reminds me of some of the pics I find of sinister/creepy looking Easter bunnies and I wonder if there are more like it. I was bored and decided to look that up, its from the movie Confessions of a Sociopathic Social Climber. If you ever need to find a picture, try the reverse image search on Google, you can upload anything and it'll look for similar stuff. (04-15-2017, 07:02 PM)Berries Wrote: I was bored and decided to look that up, its from the movie Confessions of a Sociopathic Social Climber. I think it would be ..slightly difficult to find stuff that would be unsettling other than actual snuff videos or people hurting animals for entertainment/fun which I believe is true for most people. ....and if that isn't enough here are some boards on Pinterest where I tried to collect/pin some of the creepy images I found on forums and on Pinterest itself. Srsly, what Rabbit has k9 incisors? 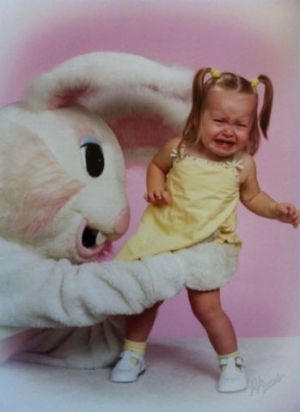 Hope you're having a good Easter!